You will be given a reference e-book to read which has 834 pages And the test will be based on that e-book , you can take final test within 1 year of purchase. Public financial management refers to the process of collecting adequate economic resources in the most appropriate manner and then efficiently and effectively allocating and utilizing the collected resources. A good public management system also requires three vital components including resource allocation, resource generation and resource utilization or expenditure management. If you have longed to take up a public financial management course, then it is important for you to have a little background about public finance. Public finance actually refers to the study of the government’s role in the economy of a country. Public finance is also based in three major elements and these include the efficient resource allocation, macroeconomic stabilization and income distribution. When attempting to get your public financial management certification, then you should keep in mind that the whole public finance management process requires you to deal with all the phases linked to expenditure management and resource mobilization in the government. Public finance management is extremely important in the governance process. Its importance is similar to effectively managing the financial aspects of a business organization to increase its chances of achieving growth. It should also be noted that becoming a public finance management expert requires you to improve your skills in resource mobilization and in the prioritization of certain government and public programs. You should also become aware of how the budgetary process works and how you can exercise effective controls especially in managing public resources. You should also understand the importance of accountability and transparency when it comes to promoting aggregate fiscal discipline. If you are planning to work for the public through your public financial management certification, then the certification course offered by Brainmeasures linked to this process can be extremely useful for you. Everything that you need to learn about public finance and resources and the secrets in effectively managing it is covered in the program so you can expect to receive the kind of training that you have hoped for. Brainmeasures is an online certification company which has already received its ISO certification so you can expect all its programs to run based on high quality and legitimate standards. To determine if you are worthy to receive your public finance management certificate, Brainmeasures will require you to take its online management test linked to the course at the end of the program. Passing the public financial management exam will show that your skills and knowledge are already enough to become successful in the field. 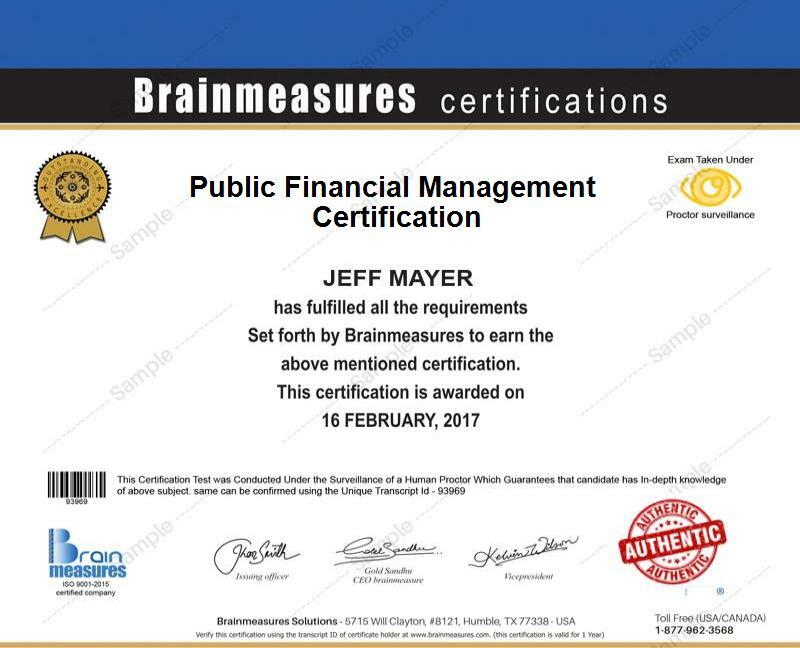 Brainmeasures make it a point to create a public financial management certification program which is capable of meeting the needs of individuals and professionals who are interested in gaining a more comprehensive background about the field. This program is more beneficial for professionals and administrators in both government and not for profit organizations who are planning to improve their skills and knowledge in organizational budget development, governmental and fiscal budgeting and financial management and governmental accounting. It should also be noted that the average annual salary for public financial management certification holders is now $70,000.